As 2016 gets underway, AMI decided it was time to take the temperature of the commercial install market, looking at the current challenges and opportunities in four key segments. David Davies spoke to leading vendors in each to see how things stand at present – and get an idea of their expectations for the year ahead. More fully integrated control systems, custom integrator-friendly amplifiers and loudspeakers, and compact mixers are among the product trends to have ensured that fixed installation has become an increasingly important contributor to pro-audio manufacturers across the board. But what are the emerging requirements in some of the main install segments as we enter 2016, and how are vendors responding to them? With a decline in recording revenues forcing more acts out on to the road for ever-longer tours, and concert halls consequently having fewer and fewer gaps in their schedules, it stands to reason that all stakeholders must be increasingly cognisant of maintaining quality in order to encourage repeat visits by both acts and gig-goers. But this goes beyond the specification of suitable speaker systems, which in L-Acoustics’ case includes the K2 line array, with Panflex directivity control, and the 2015-released X Series coaxial products that include a reference stage monitor, a live FOH monitor and coaxial speakers that can be used in distributed systems or as fills. Oliver Sahm, director marketing application design at Bosch Security Systems, concurs about the heightened expectations of high-quality audio for speech and music. This is accompanied, he says, “by increased requirements for detailed supervision and monitoring of the systems and interaction with media distribution”. 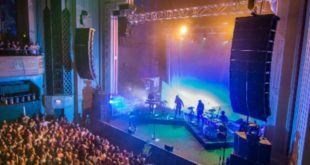 Whatever system is eventually chosen, it is evident that venue owners and operators are now highly exacting when it comes to specifying the right system for the long term, taking the time and trouble to tap suitable specialist assistance. Unfortunately, it seems they don’t always optimise the project during its final stages, suggests Montrezor. 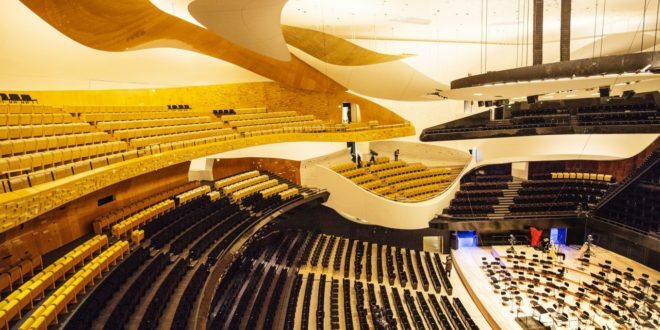 Acoustics are becoming a bigger consideration in concert venues such as the Philharmonie de Paris. The permanent calendar of major global sports events such as the Olympics and the FIFA World Cup, as well as a busy repeating programme of international athletics events, has traditionally resulted in a steady stream of new work for pro-audio manufacturers and installers. 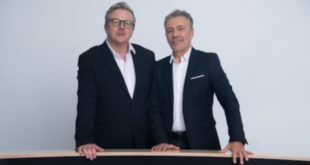 Highlighting a product range that includes the 180-model Electro-Voice EV Innovation range (“designed with the contractor in mind”), and notable recent installations such as the Allianz Riviera Stadium in Nice, France, Sahm underlines the continuing buoyant health of this market sector. In distinct contrast to stadiums, where budgets are generally substantial and there is little difficulty scaling a high bar for audio quality, educational facilities will often have to contend with very limited funds. Nonetheless, it is generally felt that they are increasingly astute when it comes to the specification of new systems – calling upon specialist consultants and integrators whenever possible to help ensure that they get the best value for money. It’s no surprise to discover that, in many cases, these systems must be able to handle a wide variety of activities – from school meetings to live performances and more. But increasingly there is a call for more extensive integration with other AV equipment, as QSC’s director of sales EAME – systems group, Glen Harris, observes. 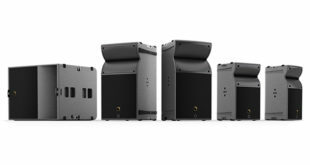 Harris anticipates continued growth for QSC in the educational market, not least due to the arrival of new products such as the Q-Sys Core 110f DSP appliance. A total of 128 x 128 network audio channels, 16 x 16 USB audio channels, 24 channels of analogue I/O, eight configurable flex channels, 16 x 16 GPIO Logic Ports and 16 channels of routable AEC are among the features of the new appliance. Sound reinforcement pioneer Funktion-One has been synonymous with high-end leisure and entertainment installations for nearly 25 years now, and director Ann Andrews confirms the growing expectations of quality throughout the bar and restaurant sectors. In terms of new products geared towards these space-conscious environments, Andrews points to the MB210 low-profile bass [enclosure], while with “the rise in the number of outdoor installations for beach bars we have had to introduce products with weather-resistant qualities”. But more generally, she remarks that all of Funktion-One’s “small systems sell particularly well into this market with the associated low-frequency products”. Taking stock geographically, Andrews cites “particular growth in the Middle East and Ibiza, and in beach bars generally”, while foremost expectations for 2016 include “steady growth, along with increasing awareness of the importance of sound quality”. High-quality audio and the need to respect the proximity of local residents were among the primary factors that informed the installation of Funktion-One speaker systems at two new rooftop restaurant/bars in Beirut, named Iris and Caprice. Installation at the venues – both of which are owned and operated by Addmind – was carried out by Funktion-One’s distributor in Lebanon, Audiotec Group. The ability to deliver low level background during the day, live performances in the early evening and louder club levels into the night were priority considerations for the installation at Iris, which is located on top of the iconic al-Nahar building and incorporates an outdoor deck and wooden bar. 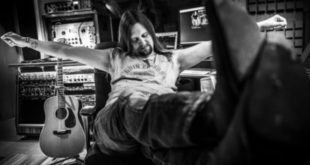 “We also had to be conscious of neighbours,” says Funktion-One design engineer Mike Igglesden, who worked with Audiotec Group to design the systems for both venues. “To deal with this, we designed a twin four-point system of F101s for the central area and stereo F81s for the surrounding areas. By doing this we were able to create a high intensity in the middle due to the general close proximity of the speakers. Despite there being 25 speakers, we’ve kept the number of source locations to six. Located on the Jal El Dib seaside road, the Caprice venue also utilises a host of different Funktion-One products, including Resolution 2 speakers, F101s, F88s and BR218s. Main Picture: The recent Bosch installation at the Allianz Riviera Stadium in Nice, indicative of a healthy stadium sector.